- Two years ago, my friend Kyle and I perfectly executed our plan of traversing the Presidential Range in the White Mountains, driving to New York, and traversing the Great Range in the Adirondacks . . . all within a calendar day. (click here for report). After that successful adventure I knew I'd want to do something similar but without the five hour drive, so I kept it local with a Presidential Range Traverse followed by a Pemi Loop. Kyle, unfortunately would not be joining me as he is still getting back into trail running shape from a nagging injury. Being solo would make this ordeal much more difficult than I had imagined, more on that later, but now onto the run/hike. 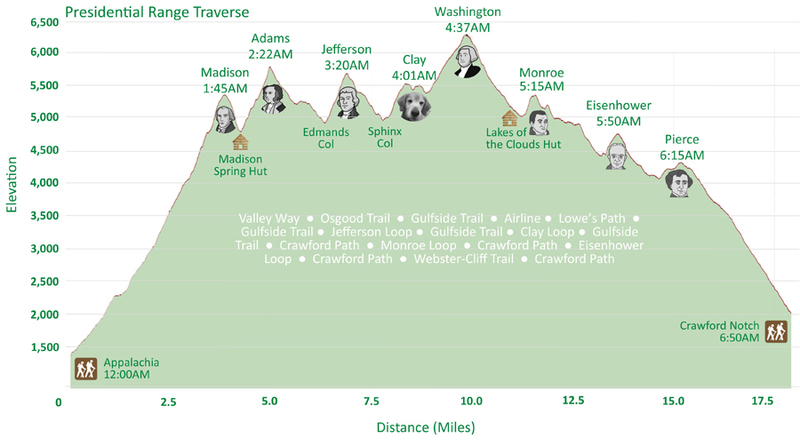 - After last weekend's Mount Adams Vertical Day Challenge, I was planning on taking it easy this weekend, that is until I saw the weather forecast for Saturday making for a prime opportunity to attempt the P&P. On Friday afternoon my friend Todd was nice enough to pick me up at the Highland Center for the car spot between hikes. Then after working all day, Whitney was gracious enough to drive me to Appalachia for the midnight start of my all day affair. - For the Presi Traverse, the Mount Washington Observatory forecasted overnight temperatures in the low 40's, 25-40MPH wind, windchill 20-30 degrees. With this in mind I played it safe and brought my bigger ultra-light pack, a Camelbak Octane 18X. I packed my winter running tights, puffy jacket, hat & gloves, light wind breaker, hand warmers, extra shirt, 1.5 liter water bladder, along with plenty of food. - As we approached Appalachia I noticed the bottom of my pack was wet, I pulled out my water bladder but could not find a leak, my pack was stuffed to the gills and I thought maybe it was resting on top of nozzle and the weight from the pack put pressure on the rubber nozzle releasing water. Whatever the issue was, I had no time to explore any further as the clock struck midnight and it was time to get going. - It was a cool but comfortable night as I made my way up the easy grades of the Valley Way towards treeline. It was a quiet hike up as the only creature I saw was a tree frog that graciously leaped from the woods off trail to a rock on the trail to a tree on the other side of the trail, much different than all the toads I'm used to seeing hop slowly and weeble-wooble around the trails. - When I made it to the weather warning sign I geared up for the cold and windy alpine zone, shorts off - leggings on, soaked shirt from sweating off - dry layer and wind breaker on, and hat-gloves-handwarmers on. - Up Madison summit cone I went where I started to realize the OBS forecast was spot on, it was cold and I knew Mount Adams across the col would only be colder and windier. I was expecting these conditions on Washington's summit cone but was hoping for a little reprieve on the other peaks, no dice at 2AM! - I made quick work of Madison and soldiered on up to Adams where I realized this was going to be an on and off grind until well past Monroe. When I summited Adams I hid between boulders out of the wind and put on my puffy jacket. I now had a base layer, wind breaker, and puffy on, and I needed all of it. Luckily, I warmed up instantly and knew I would be out of the wind very soon. I battled my way into to wind for a few tenths of a mile to the Gulfside Trail and five minutes later, shielded by the sub peak of Sam Adams, I was unzipping my puffy and wind breaker and was now able to enjoy walking under a million stars. - Heading across the range in the middle of the night is a very unique experience, I basically had the whole range to myself, one that would see several hundreds of hikers pass over different sections after sunrise. - As I made my way to Washington via Jefferson and Clay, alpine glow to the northeast started to creep up behind Adams and Madison, it was a beautiful sight to behold. By the time I started up Washington's summit cone, 4:10AM, I was able to remove my headlamp and boogie on up to the top where the winds were blasting at a pretty intense rate. - The tough part of the Presi Traverse was over, now it was time to put it on cruise control and keep a nice easy trail run/quick hike pace through the southern presidentials. Along the way I stopped at Lakes of the Clouds Hut to restock on water, caught the sun rising above the shoulder of Washington from Mount Monroe, and finally was able to remove my puffy jacket before heading up Eisenhower. - From Eisenhower I made quick work of Pierce before dropping down to my Jeep at the Highland Center in Crawford Notch, finishing the first phase of the P&P in 6 hours and 50 minutes, next up Pemi Loop, but first the AMC Highland Center breakfast buffet! - The buffet is $16 and was absolutely worth it, perfect for what I was undertaking. They have cereal, oatmeal, granola and yogurt. More importantly they have scrambled eggs, hash browns, sausage and bacon, and today they were serving cinnamon French Toast! There is also fruit salad, along with whole apples, oranges, and bananas. For beverages they had orange juice, cranberry juice, hot chocolate, and coffee. I stuffed my face with the important stuff and downed a few cups of OJ, very satisfying. - After breakfast I changed clothes and headed off to Lincoln, stopping along the way to pick up food for the Pemi Loop. - When I arrived at the Lincoln Woods trailhead, I switched packs from the Octane 18X to the much smaller Nathan Running Fireball 7L Hydration Vest. I added 1.5 liters of water, and filled the small pouch in the back with food like an over stuffed Thanksgiving Turkey. Soon after starting my hike I realized I had a major problem as the bottom of my pack became wet and my shirt was wet, there was a leak, but why did this not effect me on the Presi Traverse? Well, it had to do with the amount of water in the bladder and the pressure put against the bladder. For the Presi Traverse I only had to have the bladder filled to 1 liter as I could use the two huts to restock, so as soon as I started drinking and the water level dropped there was enough room inside the bladder for the water to spread when there was pressure against it. Plus, once I was above treeline I had everything in the pack on, so no pressure on the bladder. However, with the tiny vest, I was screwed no matter how much water was in the bladder, creating a small drip leak. - So what I did was two things, I took almost everything out of the pouch except a small sandwich, my electrolyte drink I held in my hand, I was able to shove food into my chest pockets, I had a banana sticking out of one pouch, I must have looked odd to everyone. Also, I shoved stuff into my short pockets. The dripping was at the bottom of the bladder so I flipped the bladder upside down and this worked almost perfectly, except the tube connects to the bottom of the bladder so after a few sips of water I was now sucking air, in order to get by this I would lean over and then take sips, it was a funny sight but worked! - However, all this affected my confidence and as I made my way up the Osseo Trail I had no idea if I would be able to pull this off. I was going light on water to begin with since I would not be pushing the pace, I had 1.5 liters of water and 18 ounces of electrolyte drink and it needed to last me until Garfield Spring, over thirteen miles in. With all this on my mind, I plodded along slowly making my way up to the ridge toward treeline. - Wind saves the day, from foe to ally above treeline. When I broke into the Alpine Zone on Little Haystack I was greeted with strong 25-35MPH winds and comfortable temps. I was now hiking with my closest hundred friends along the Franconia Ridge, everyone was in long sleeves but me. It was a zoo, holy sh!t, thankfully everyone was nice and let me pass easily. 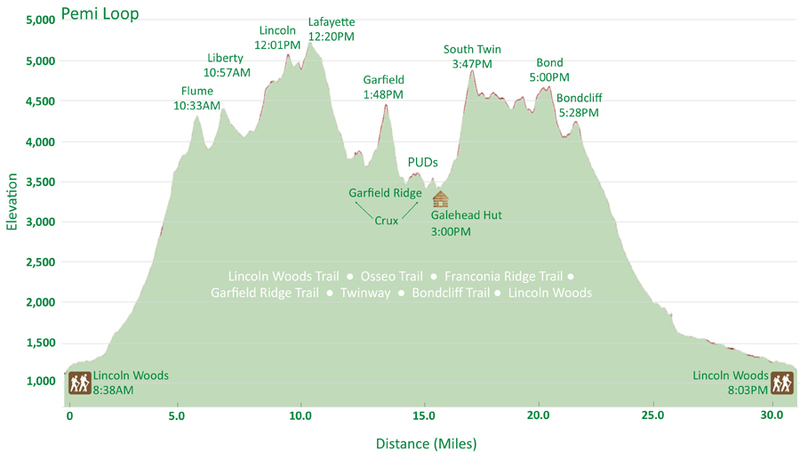 When I reached Lafayette's summit I took a ten minute break to have lunch and prepare myself for the crux of the Pemi Loop, the Garfield Ridge Trail, the trail that made me cry thirty years ago when I was eight years old. - As I made my way past North Lafayette and down below treeline my confidence waned again, this is going to be pure hell dropping down a few thousand feet and having to steeply rise up the Mount Garfield. I stayed focused on foot placement and concentrated on pace knowing every PUD (pointless up and down) along the way. I also passed a group Pemi Looping who were going slow, which gave me a boost in confidence, knowing there are others out there doing the same thing helped at that moment. - I noticed I was making much better time than I had expected and was closing in on Garfield Pond, which is the start of the final ascent up to the summit. Here, I ran into two groups heading the wrong way, they were looking for a trail to make a "loop hike" of Mount Garfield, yikes! Apparently, they had an app on their phone that showed the Garfield Pond Cutoff, which has been abandoned for over forty years! I told them the bad news about the trail no longer existing and they would have to head back up and over the summit. - Upon reaching the summit I took a short break and finished off the rest of my electrolyte drink before heading to the Garfield Spring, here I chugged some cold refreshing water, fingers crossed I don't get sick in a few days. - I then navigated down the waterfall section of the trail, which was mostly dry before making my way through the PUDcoaster to Galehead Hut. I arrived at the hut at 3pm, 6 hours and 22 minutes after starting. One last steep section remained and then it was all gravy. Before heading up to South Twin I took a relaxing break at the hut, eating the rest of my soggy sandwich and chips, refilling my water, and preparing my fuel for the rest of the hike. - Galehead Hut to South Twin is 0.8 miles and over 1,100 feet of elevation gain, the footing is pretty nasty for most of it over odd sized boulders. Usually I try and see how fast I can motor up this beast, today I took baby steps all the way while keeping my head down, never looking up only to be demoralized at the sight of a never ending steep trail corridor. The plan worked perfectly, I slowly made my way to the summit and didn't needlessly exert any extra energy, feeling as fresh as I could be after a tough ascent. - Following a quick stop to take pictures at the summit of South Twin, I made my way along the Twinway towards Guyot over mellow grades and decent footing. The murderers row of grade and footing were all behind me, basically I had two more easy ascents over five miles, four miles of downhill, and five miles of flat railroad grade walking to finish this off. I did start letting myself think about what time I might finish, but I still payed close attention to foot placement, fueling, and of course hydration, which I'm happy to say the upside down bladder worked well, I'd check my pack every half hour to an hour just to make sure it wasn't leaking and to check my water level. - After 2.5 miles along the Twinway from South Twin, the trail breaks out into the open and heads over Guyot before dropping to the Guyot / Bond col. I was greeted with a refreshing blast of wind over 20MPH. I took a short break here before my two final ascents of the day, Bond and Bondcliff. At this point I knew, baring some sort of unfortunate incident, that I was going to complete the P&P. - The hike to Bond was a breeze, while the hike down and up to Bondcliff was a little more difficult as the sun was relentless when I was on a part of the trail shielded by the wind. I was really lucky for that stiff breeze all day, as just ten minutes in the sun without the wind was torture. - Aside from the sun, the hike to Bondcliff was as magical as it always is, Hellgate Ravine drops sharply down to the right of the trail and the "Monster Slides" of West Bond are in perfect view. I'm happy to report there is a brand new slide, it sits to the right of the three original slides and looks steep and maybe technical, it was tough to tell from my vantage point with the sun and shadows in the ravine. - There were several people on the summit, a few chatting, one sitting in a backpacking chair that he hulled up to the summit, and two dudes passed out sleeping. I didn't stay long, just a minute or two taking pictures before heading down below treeline to start the long downhill march to the floor of the Pemigewasset Wilderness. - Needless to say I was tired but I was still holding up well over forty miles into a fifty one mile day. The descent to the railroad grade went extremely well, I made such good time that I headed over to the Black Brook Trestle to take picture of the now half fallen trestle as the October 30th, 2017 storm knocked half of it down, the trestle which had been standing for a hundred years finally succumbed to the weather. - Since I was making good time, I figured I would take pictures of old railroad relics on my five mile flat hike back to Lincoln Woods, however I soon began getting attacked by mosquitoes. I didn't have any bug repellent so I had to speed walk the five miles, when I slowed down I was getting eaten alive. Mercifully, the swarm of mosquitoes relented a bit once I hit the wilderness boundary. Soon there after I saw a woman staring up into a tree, she was looking at a porcupine! I had actually never seen one while hiking so that was a bonus. She then told me how she had gotten lost coming off Owl's Head and had to bushwhack down to the Lincoln Brook Trail, an experience I'm sure she'll never forget! - I kept forging ahead and the end was in sight, as I passed the Osseo Trail junction I had just over a mile to go when I saw a tall object lumbering its way towards me in the middle of the trail, a huge bull moose! It stopped when it was about a hundred feet away and just stared, after about thirty seconds it moved off trail to the right of me, paying close attention to me, then it moved back into the middle of the trail, gave me one last look before heading off trail to the left of me stopping again this time off in the woods. I quickly took this opportunity to speed walk by him and never looked back until I reached the suspension bridge finishing my Pemi Loop! - It was 8:03PM, 11 hour and 25 minutes after I had started the Pemi Loop, and 20 hours and 3 minutes total on the day. I was tired and sore but my body held up extremely well. - Back at the car, I stretched a little bit and and cleaned myself off. I usually head down to the water but was starving for some trash food so I headed into town and had my annual visit to McDonald's for a chicken sandwich, fries, and a diet coke, which I scarfed down in about five minutes before making the hour drive home to see Whitney and Sarge, who acted like I had been gone for a month! - The Presi & Pemi in a day was a success, albeit it a brutal and physical beating, one in which I enjoyed from beginning to end. Compared to the Presi & Great Range I found it to be much tougher because I was solo all day, and there were no conversations throughout the day to take my mind off the grind and to help with pacing. Being alone for that long while grinding out miles is mentally draining, luckily I have done several big all day hikes so I knew how to just push through those lulls. - As for what I'll probably remember the most, hiking under a million stars as I headed to Mount Jefferson, the alpine glow behind Madison and Adams while having the range to myself, and of course walking over the East Branch Pemigewasset Wilderness suspension bridge and finishing off a night & day I will never forget! Map of my planned route(s) for the day! The Jefferson snowfield, I wouldn't want to deal with this at night in the winter or early spring! For the fourth straight year I was on the rock pile the day of the road race. Two of those times were at dawn. Quiet and peaceful now - crazy number of people later! End of the Presi Traverse! Summit pins / markers. Missing Mount Adams as it was too damn cold!! The Garfield Ridge Trail waterfall section, very dry, I was very happy! Lower Bondcliff Trail, used to be called the Lincoln Woods Trail, before that it was called the Wilderness Trail, and originally was a railroad! My meeting with the bull moose, he was a big boy! Wow - such an effort! Amazing Report Chris. I can't imagine doing those 2 hikes in a calendar day. I was on Ethan Pond Trail Saturday and wondered if you were hiking in the area. That is a huge bull moose too. Thanks Chris Dailey for shearing this kind of post.